Everybody has been requesting it and SportDog made it happen - a Dog GPS tracking system paired with a remote training collar, both controlled via a single hand-held transmitter! 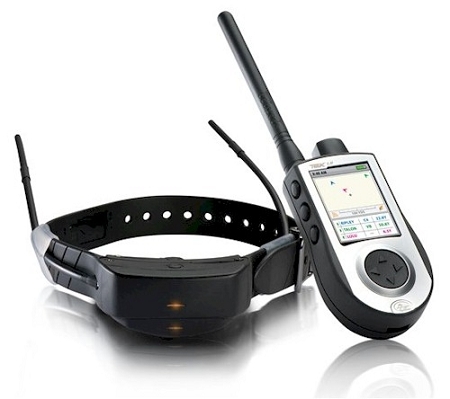 The TEK 1.0 LT by SportDog is an easy to operate GPS based combination dog-tracking system and remote training collar that offers a graphic map display showing both you and your dog's precise location. At a glance you can easily see where your dog is, exactly how far away in yards or tenths of a mile, as well as whether or not your dog is stationary or moving. In addition, the SportDOG GPS and E-Collar System is also a remote training collar with an amazing range of up to seven miles and offers 100 levels of stimulation. In addition to stimulation, you can select from vibration and tone only options. The SportDog TEK 1.0 is the system that countless dog handlers have been patiently waiting for - both a dog tracking system and remote training collar operated from one handheld unit, and on one collar. We have tested the TEK 1.0 carefully and found it to a very nice, easy to operate system. It's effortless to switch from the remote training screen to GPS locator screen. The TEK-V1LT is perfect for bird dogs and hounds as well and you can manage up to 12 dogs from a single transmitter. The SportDOG TEK-V1LT will operate for 20 hours on a single charge, and is totally water-proof and submersible up to 25 feet. The handheld device is waterproof and submersible up to 5 feet. Charger is included. Covered by the SportDog Two Year Warranty. Add up to 12 dogs to the Tek Handheld GPS E-Collar system. All you need are extra TEK collars.